Giving away free stuff is fun. Especially when I know my content helps people improve their health. My products below will help you harvest wild edibles more responsibly, blend better tasting green smoothies, and laugh more. I hope you enjoy my secret stash of goodies! Download and share any of these products freely with no strings attached. For more free content, visit my YouTube channel: BoutenkoFilms. It’s filled with hundreds of videos about everything from smoothies to van life. You can also visit my shop and check out more great content. In this handy chart, I outline nine of the most common wild edibles found across the globe. 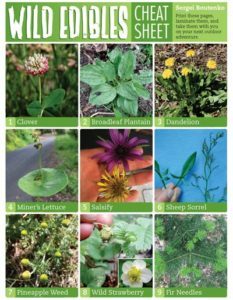 Print it out, laminate it, and take it with you on your next wilderness outing and make foraging for wild edibles a breeze. 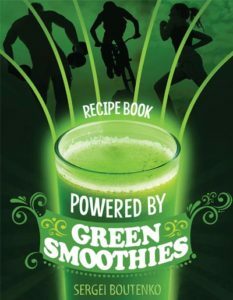 Powered By Green Smoothies Recipes eBook is a satellite to the film. It offers a summary of the documentary and gives you access to the same smoothie recipes that my athletes consumed during the experiment. Unzipped is a short story about a young man who wakes up one morning with a zipper on his body. Curiosity begins to gets the better of him as he wrestles with the desire to unzip it. This is a creative piece I wrote in college. 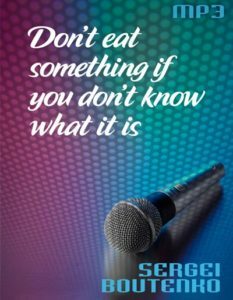 Don’t Eat Something if You Don’t Know What it is, is a silly song about avoiding poisonous plants when foraging for wild edibles. This rap helps your remember how to stay safe while harvesting wild edible plants.